From every single angle the Dreamliner is a sensational story. The world is riveted to the mystery and the drama, the politics, the economics and the engineering. So what do you say we take a break from all that? Today, I'm writing about an enthusiastic school girl from Sydney, Australia who has taken on a campaign to honor an air safety hero. Most children are happy when their homework assignment gets them a good grade, but after writing a report about David Warren, the Australian who invented the black box, 11-year old Eve Cogan set her sights on convincing the executives of Australia's capital city airport in Canberra to name the airport after him. 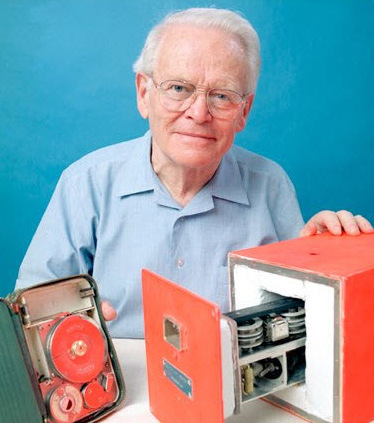 For her assignment to research a famous Australian, Eve could have studied Peter Blamey, of Bionic Ear fame. But having spent many an evening watching air crash documentaries with her dad, the child found the late David Warren a more interesting choice. "I’ve seen a lot of episodes of air crash investigation and a lot of the time it’s the black box and that’s the final clue that they need," Eve told me during a skype interview recently. In a 15 minute video that became her term project, (see it on her website) Eve explains that Warren's idea to install a highly protected recording device on airplanes was first rejected as unnecessary. But persistence and timing came together so that the brilliance of his idea was finally recognized in the 1960s. Now of course, airliners around the world are required to have them. Data recorders of one kind or another are used in all sorts of safety investigations. Warren was not just a man with insight, he apparently had a great sense of humor, or at least his family did. Richard de Crespigny, who as captain of the near disaster that was Qantas Flight 32 is no stranger to aviation heroics, told me that when Warren died in 2010, his survivors emblazoned his coffin with an orange label reading, "Flight Recorder Inventor - Do Not Open." Like Eve, de Crespigny believes the inventor's impact on the industry, warrants more attention than just a role in the homework of Australia's school children, even if it was, in Eve's case, a starring role. He's backing Eve's request to the director of Canberra Airport to dial up from that meh moniker by switching to David Warren Airport. Of course there's a problem, and it isn't just what airport spokeswoman Jane Seaborn told me in an email, "Canberra Airport already has a name." Nope, in a phone call to Eve, the airport's director, Steven Byron told the child, when it comes to air travel passengers don't want to be reminded that things can go wrong. That's not an unexpected position but in this case it is quite curious because Qantas has already taken the bold step where Byron hesitates to go. Qantas christened its 9th Airbus A380 registration VH-OQI David Warren. Eve and the subject of her research share the personality trait that allows them to see setbacks as opportunities. With her online petition garnering signatures by the day, Eve enrolled the help of Capt. de Crespigny and Miracle on the Hudson pilot, Sully Sullenberger the two most famous pilots since Antoine St. Exupery and Claire Chennault. 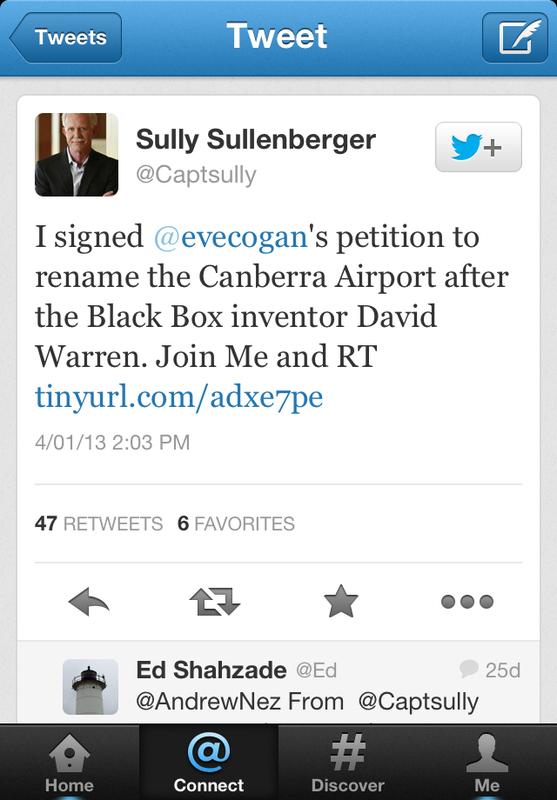 Sully signed Eve's petition and urged his Twitter followers to do the same. De Crespigny, who tweets, @RicharddeCrep also gave Eve's efforts a boost in social media. "I support the intrepid spirit of an 11-year old girl," de Crespigny told me in an email, for the "inspiration and drive to do what she thinks is right." As I read Richard's words, I realized the child and the inventor have more than one personality trait in common and I suspect Eve Cogan may make a little history herself. Flight recorders? Meh...all a real aviation accident investigator needs is a notebook, a pencil, and a camera. Ha! Having said that, there is logic behind the government phrase "probable cause". Aviation accidents are so chaotic with many very complex ramifications, both human and mechanical. In many cases an exact, provable, not probable, but provable cause can never be determined. Bob, Your description of the "logic" behind the NTSB's use of the finding "Probable Cause" is accurate, but your etiology of its use is not. The term "cause" first appeared as a requirement for determination in aircraft accidents in the Air Commerce Act of 1928. The requirement was modified to "Probable Cause" by government attorneys in the 1934 Amendment to the Air Commerce Act, whose argument was similar to yours: it wasn't possible to determine the cause of aircraft mishaps accurately. That might have been true in 1934, but gives short shrift to the technological advances of the past 65+ years. Unfortunately, use of the term "probable cause" has excused less robust investigations that might have benefited from more scientific methodologies. Of course, all one needs is paper and pencil to determine the probable cause of an accident (it all depends on how probable one wants it to be), but that's besides the point. First of all, we should congratulate Eve Cogan for bringing this to the foreground and the way she takes initiative. She will probably be a good engineer and manager if she pursues this direction. More importantly, the black box was a kind of trigger in changing the attitude in safety thinking. Any system/device that poses safety risk should have some device that records the history to learn from the times it goes wrong. Moreover, it has a serious impat on the architecture. Just imagine what it could do for cars. There are about 35000 people killed/year in the US and in Europe each year. The aviation industry has less than 500/year worldwide. This is what the black box has given us (of course there's more to it but it is a device that is symbolic for a difference in culture). And if you're interested in pursuing the story, there's an article in the January-February 2013 issue of 'Flight Safety Australia' magazine (www.casa.gov.au/fsa), which marks the 50th anniversary of the mandating of the black box in Australia. Radio and cockpit and audio recording is, in addition, an invaluable tool in learning what happened. Some of the environmental requirements are mind-blowing; imagine the engineering needed to endure a crash at hundreds of miles an hour and a fire afterwards, or weeks at 2,000 fathoms of water -- and still allow stored data to be read. The Air France Flight 447 data recorder was recovered from almost 13,000 feet of water. *Smiths Aerospace was bought by GE Aviation in 2007. Everybody knows flying with commercial airlines can be sometimes very frustrating. We can mention here what situation comes up when dealing with commercial airline; you get a delayed flight schedule, losing your luggage, security issues and other problems that you might even think about it.